Many studies have claimed that sijochang spread to the lower classes to such an extent that it effectively became a popular genre in the 19th century, and this assertion is now generally accepted as fact. Considering that sijochang is not difficult to perform and can be performed without instrumental accompaniment, it is only natural that sijochang should spread. However, there is some doubt whether the ordinary folk in the 19th century enjoyed sijochang, which had been mainly enjoyed by the men of the upper classes and professional musicians in the 18th century. The arguments concerning the popularization of sijochang in the 19th century hitherto have depended on the existence of the anthology Namhuntaepyeongga, which was commercially woodblock printed in 1863. 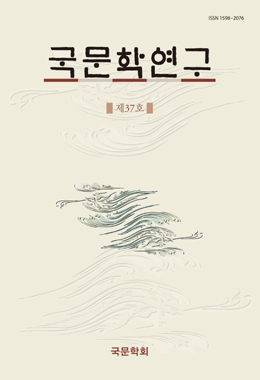 Many scholars have regarded Namhuntaepyeongga as a collection of sijochang lyrics and presented it asevidence of the popularization of sijochang in the 19th century. However, it is not clear whether Namhuntaepyeongga is a collection of sijochang lyrics intended for singing. There is the possibility that the main purpose of Namhuntaepyeongga was to offer an anthology for reading rather than for singing. This paper reopens the discussion of whether or not sijochang became a popular genre in the 19th century, based on materials other than Namhuntaepyeongga, and then carefully examines the purpose for which Namhuntaepyeongga was published.